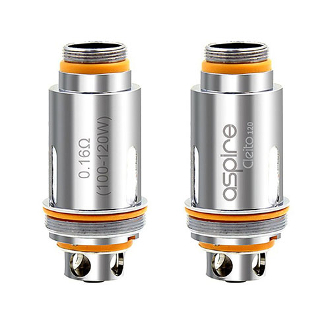 The Aspire Cleito 120 clapton coil was designed specifically for the Cleito 120 4ml Tank. Using a clapton coil results in an enhanced flavor profile and increased vapor production. Designed for 100 watts and higher, enjoy smooth airflow, intense flavor and hugh vapor production with the Aspire Cleito 120 clapton atomizer heads. With an all new atomizer design that replaces the standard chimney, similar to a cartomizer, allows the atomizer head to deliver maximized airflow and vapor production. **We suggest 6mg eLiquid or lower with this atomizer. Sub-ohm atomizers produce higher throat hit than low and standard resistance atomizers. Using this atomizer with a nicotine level above 6mg will usually taste harsh or burnt.